First AI Product Cleared for Medical Imaging Enhancement. MENLO PARK, Calif., Dec. 5, 2018 /PRNewswire/ -- Subtle Medical, a privately-held medical device company focused on improving medical imaging efficiency and patient experience with innovative deep learning imaging technologies, announced today 510(k) clearance from the U.S. Food and Drug Administration (FDA) to market SubtlePETTM. Subtle Medical also recently secured approval to affix the CE Mark on SubtlePET to begin marketing in the European Economic Area without restrictions. Subtle Medical is developing additional products to be submitted for FDA clearance. 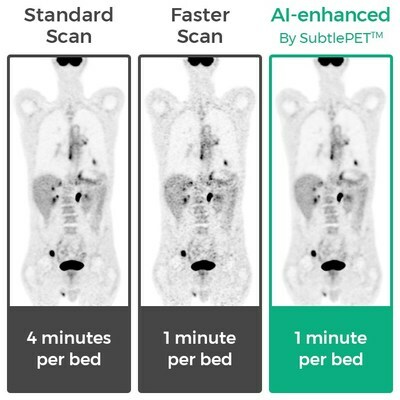 A second product currently undergoing clinical evaluation is SubtleMRTM, which allows imaging centers to significantly accelerate MRI scans using the company's AI solutions. SubtleGADTM is also being developed to reduce gadolinium dosage during imaging procedures. Subtle Medical, Inc. is a medical device software start-up spun out of Stanford University by Enhao Gong, PhD and Professor Greg Zaharchuk, MD, PhD. The Menlo Park, California-based company licensed multiple patented and patent pending technologies and extensive datasets from Stanford radiology labs and clinics. Subtle Medical is developing and commercializing a suite of deep learning solutions for augmenting medical imaging by focusing on the acquisition phase of the imaging workflow, improving patient experiences, ease-of-use, and reducing costs for hospitals and imaging centers. For more information, please visit http://www.subtlemedical.com.